Tips of the Golden Dragon’s Tail is one of the classic Spring Green teas of coastal eastern China. Elegantly formed into its flat, sword-like shape and with the general appearance of a well-made Dragonwell, this tea is not only beautiful to look at but is delicious in the cup. And it has always been one of our top sellers in the years that it has been available. 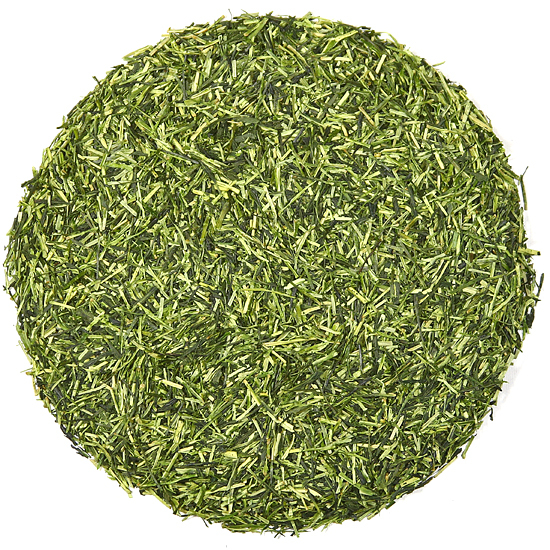 There are several pan-fired green teas in the Dragonwell style that we have tasted over the years, but in this style of leaf Tea Trekker generally tends to prefer offering several choices within the authentic family of Longjings – the teas from the historic region of production for Dragonwell. True Longjings are hard to beat and have earned the reputation that they deserve, and we do offer several very specific village growths every year. However, there is always room for an exception, so for many years Tips of the Golden Dragon’s Tail has been a notorious adjunct to our selection of Longjing teas. Being a unique and consistently wonderful tea in its own right, it does not attempt to pass itself off as just another copycat of anything. This flavorful and distinctive green tea has a different style of nuttiness and richness that speak to its own place of origin – and does not rely on another tea’s provenance. Sometimes teas in this style from Eastern China, but not from the official Longjing district, are called (or referred to as) Jin Long, which is a sly re-arrangement of the Longjing name (obvious ‘borrowing’ to some and not to others, depending on how much of a wordsmith one is!) however we tend to simply provide a beautiful name for this tea and enjoy it as a pan-fired country green. When similar teas are crafted from different cultivars or sub-varieties of camellia sinensis, the results should be unique and different; the goal should not be to duplicate, replicate, or copycat. As a Pinot Noir and a Merlot will be immediately recognizable one from another, so too will a premium Tips of the Golden Dragon’s Tail be identifiable from its cousins in the family of Longjings. These two tea productions come from a similar style of production, but the core leaf is very different and distinct. What we like about this style of tea is the richness and smoothness of flavor – attributes that develop during the intense and carefully-tended firing in a reasonably hot leaf-firing pan. What we love about Tips of the Golden Dragon’s Tail is its unique flavor and aroma. There is a complexity to the nuttiness – sweet, salty, fruity – it is complex in a very drinkable way. The aroma rises straightforwardly out of the teapot or cup and draws the enthusiast into its atmosphere – seducing the tea drinker into enjoying its liquor. Many teas do this, but not with this particular flavor profile. If you haven’t tried this unique tea, you might want to consider this an opportunity.